Features 1080p60 and 720p120 video, 12MP photos up to 30 frames per second, built-in Wi-Fi and Bluetooth, and Protune for photos and video. Waterproof to 131 (40m). 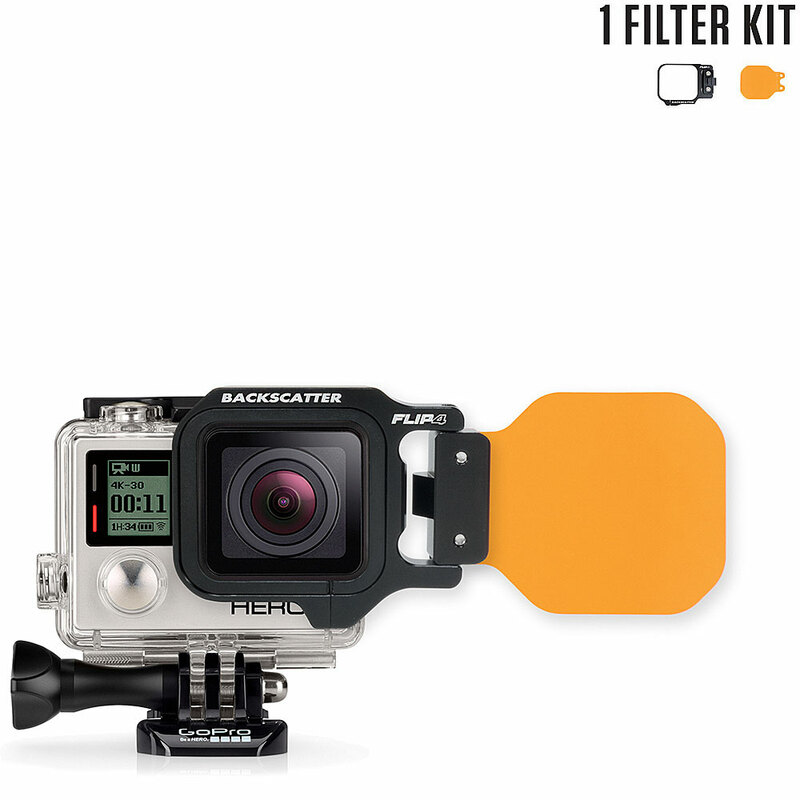 Outfit your GoPro Hero4 with both a shallow water and deep water flip filter and even a sharp macro lens for detail shots on the reef. Capture your world in an all-new way with HERO4 Silver, the first-ever GoPro to feature a built-in touch display. Controlling the camera, framing shots and playing back content is now ultra convenientjust view, tap and swipe the screen. HERO4 Silver captures 1080p60 and 720p120 video with lifelike clarity, plus 12MP photos at a staggering 30 frames per second. New experience-enhancing features include HiLight Tag, which lets you mark key moments for easy playback, editing and sharing, and QuikCapture, which allows you to power on the camera and start recording with the press of a single button. Waterproof to 131 (40m), HERO4 Silver combines versatility and pro-quality capture with the convenience of a touch display. HERO4 Silver is the first-ever GoPro to feature an integrated touch display. Use it to preview photos and videos to frame your perfect shot. Play back content, and relive the moment instantly. Easily navigate camera menus and adjust settingsjust tap and swipe the screen. Featuring an enhanced sensor, HERO4 Silver boasts even better image quality than any of the best-selling GoPro cameras that came before it. Capture stunning 1080p60 video thats sharper and more lifelike than ever. High-resolution, high frame rate 720p120 and 960p100 video delivers exceptionally smooth slow-motion playback of all your highlights. 4K and 2.7K video offers ultra high-resolution, cinema-quality capture. With 12MP Burst photos at a blistering 30 frames per second, HERO4 Silver helps you capture the moments you dont want to miss. Capture single photos, or choose Time Lapse mode to shoot photos automatically at set time intervals from 0.5 to 60 secondsgreat for gear-mounted shots when the shutter button is out of reach. Night Photo and Night Lapse offer customizable exposure settings of up to 30 seconds for breathtaking images of the night sky and more. Capture the night sky in a whole new way. New Night Photo and Night Lapse modes offer customizable exposure settings of up to 30 seconds for single and Time Lapse photos. Whether youre shooting the Milky Way or a campfire hangout, Night Photo and Night Lapse allow you to you capture ultra low-light scenes like never before. HERO4 Silver features built-in Wi-Fi and Bluetooth, allowing you to connect to the GoPro App, Smart Remote1 and more. The GoPro App transforms your phone or tablet into a live video remote for your camera, offering full control of all functions and settings, easy shot preview and playback, plus sharing via text, email, Facebook and more. The Smart Remote allows you to control multiple GoPro cameras from distances of up to 600 (180m). HiLight Tag, a new HERO4 feature, enables you to mark key moments while recording so you can quickly locate your best clips later for convenient playback, editing or sharing using the GoPro App or GoPro Studio. Just press the dedicated button on the camera or Smart Remote,1 or use the GoPro App to tag your highlights. HERO4 Silver features SuperView, a GoPro-exclusive video mode that captures the worlds most immersive wide-angle perspective. It allows you to capture more of yourself and your surroundings in the shotresulting in captivating, ultra engaging footage of every adventure. Be ready to capture the moment at a moments notice with new QuikCapture mode. It turns your GoPro into a one-button camera, allowing you to power on and start recording automatically with the press of a single button. Press once to record video, press and hold for two seconds to capture Time Lapse photos. Never worry again about missing an epic shot. Protune, now for photo + video. Protune unlocks the cameras full potential, delivering minimally compressed, cinema-caliber video optimized for professional productions, and advanced manual controls for photos and video. Flex your creativity with customizable settings for Color, ISO Limit, White Balance, Sharpness and Exposureand enjoy the greatest degree of manual control available in a GoPro camera. Expand your GoPro experience with the free GoPro App and GoPro Studio software. The GoPro App allows you to control your camera remotely using your phone or tablet, view and share your content and watch best of videos on the GoPro Channel. Use GoPro Studio to create your own engaging GoPro-style videos to share with the world. 2Compared to the HERO3+ Black Edition. Always select a helmet that meets the applicable safety standard when you use with a GoPro helmet mount.